Rabbits Hutch is a studio style cottage with one queen and two singles beds. Centrally located - all within 20 minutes - is Lake Wairarapa, Lake Ferry Sth coast, Martinborough, Greytown and Featherston. 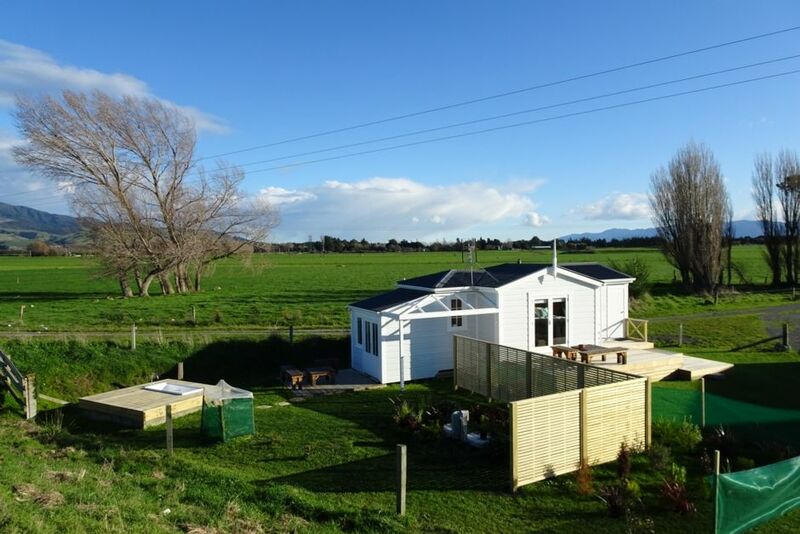 Surrounded by green paddocks with mountain views and under the big clear Wairarapa sky with fishing, swimming or just strolling along the banks of the Ruamahanga River on the doorstep - why even get in the car. Beautiful sunrises and sunsets every day. When we first arrived to the batch, I won't lie we were a bit puzzled. The outside of the batch looked small and we didn't realise the hosts house was 50 metres away. Entering the batch, however, was a different story. Whoever did the decor in there has a great creative eye. Loved the turquoise walls with the wooden panels. Loved the eccentric art pieces. Dr suess, rabbits, kiwiana, geometrics, you names it. Clean house. Mike Is very helpful! Only drawbacks were the flies (but c'mon your on a farm) and the outdoor bath wasn't too clean (I cleaned it for you Mike 😊). Nonetheless this batch was one of my faves! Would come back again for sure!! Thanks Mike for your hospitality. We had a lovely time at Rabbit's Hutch. Consistently amazed by the beautiful light and enjoyed the bath immensely. We were a little concerned that the kitchen would be too small to cook as we are both keen cooks but it was perfectly appointed with high quality equipment and we made great gourmet meals. Would return! Really enjoyed Rabbit's Hutch. It's a lovely, stand-alone studio, tastefully decorated, very comfortable queen bed, small but very adequate kitchen, good selection of books. This part of the Wairarapa is real cow-country, flat as, good for bicyling. Very friendly "instructions" telling you what you can do rather than a list of what not to do. Very quiet, way away from anything like traffic noise. lovely guests to host - left the place perfect. Could do with a "Rabbit Hutch" sign on the private road entrance. Could do with a "Rabbit Hutch" sign on the private road entrance. Google maps had us a little confused!